For those interested in deepening their meditation practice and for those exploring Theravada Buddhism come and join us. This session is for advanced meditators who have the ability to meditate, sitting and walking, for 30 minutes at a time without instructions. The length of the sitting, walking, sitting meditation is 1.5 hours. Another 30-45 minutes for "The Dhamma talk" is on the subject of meditation to help you understand and further your practice. * As soon as you walk into the Buddha's room for meditation on Friday evening please expect to be silent. Only the Abbot or the assigned monks or lay Buddhists who lead meditation will be the person does the greeting to welcome everyone to the practice of mindfulness and it is expected to short one. *The 3 bells of calling for a silence to begin the session of meditation practice. *After that will follow with three bows to pay homage to the Buddha, Dhamma, and Sangha, these bows is used to open one self to the practice of mindfulness. If one does not know what the Buddha, Dhamma, and Sangha are? Then it might be the opportunity to do some research on Buddhism before attending this session. *The last session of loving-kindness reflection will begin right after the two bells ( 5-10 minutes). *Dhamma Talk by the Abbot will begin after the loving-kindness. (expected 30 minutes). The meditation session will close with three bows out of pay homage and gratitude to the Buddha, Dhamm, and Sangha. First cultivate loving-kindness toward oneself first and always. A hostile person - someone you are currently having difficulty with. And conclude loving-kindness reflection at the end of this session to all living-beings. P.S. 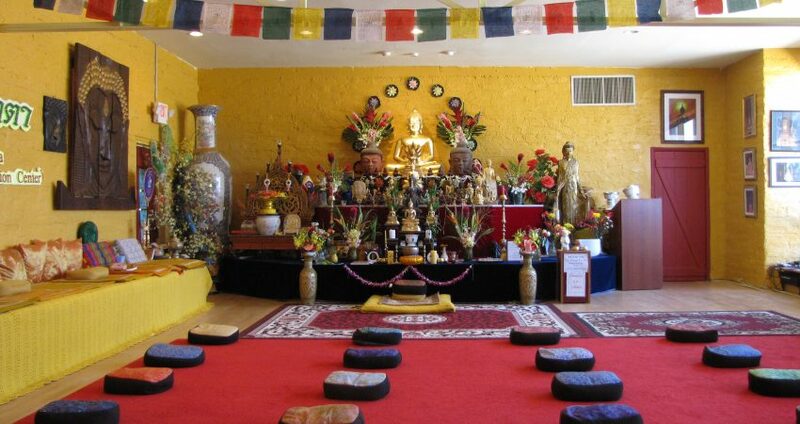 The monastery/meditation center is the place to practice the Dhamma. -Dress conservatively. Please, no: short shorts or dresses, tank tops, or anything provocative or revealing. This applies to both men and women. Appropriate coverings are available if needed. -Refrain from sitting with the bottoms of your feet pointing at the monks, nuns, or at the altar. This is considered extremely rude in Eastern culture. Please fold your legs to the side if you need to adjust your position during meditation or Dhamma talks. Come and join us to discover a peacefulness in your own mind with the practice of being mindful.